We take i-Friqiya’s indie tactical racer for a spin. The rise of downloadable games has been one of the more interesting elements of our current generation of consoles, with the PlayStation Network and Xbox Live Arcade offering some of the best value for money gaming experiences of the past five or six years. 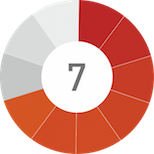 This kind of quality isn’t unanimous across these marketplaces however, with plenty of slapdash coded cliches waiting to sucker you in with a cheap price tag. In opposition to such titles are games like Fuel Overdose. The debut title from indie startup i-Friqiya, Fuel is a game that offers a niche gaming experience for a competitive price point. It’s fun, clever and offers a suspiciously decent lifespan, but its unique elements will likely prevent it from appealing to all kinds of gamers. When you think of racing games, you either think of pure racing sims like Dirt, or the arcade/battle equivalent, such as Burnout or the Mario Kart games. Fuel fits into the latter category but, rather than focusing on the accessible arcade side of driving these games so regularly subscribe to, Fuel deems itself a tactical action racer, and tactics do indeed come into play. 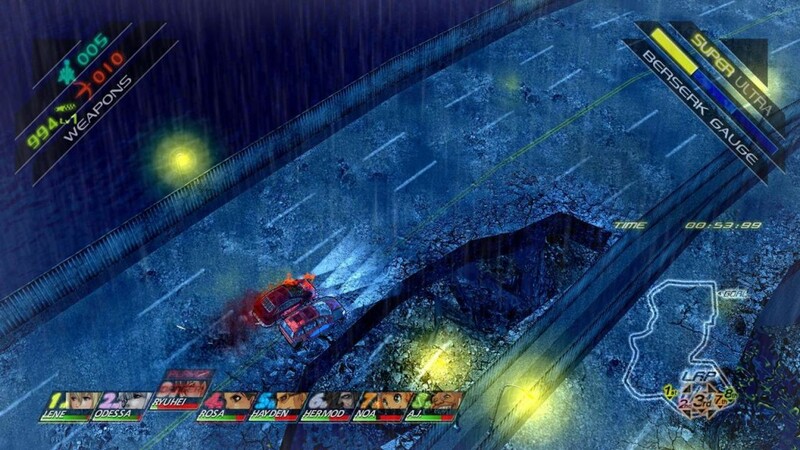 With hyper gauges to balance between specials and shields, multiple characters with unique abilities and a rather eclectic arsenal of weapons and utilities, Fuel Overdose is the thinking man’s combat racer; a fact belied by its somewhat misleading cartoon style. Let’s get that out of the way first. A quick glance at Fuel will show you the cooky art style that, whilst definitely a pleasing aesthetic, causes a few problems. A lot of stock is placed in the characters on account of how differently each one plays and, whilst some of the visual designs are awesome, many of the female characters boarder into the typically risky gender politics of outrageously proportioned anime women. There is a story mode that introduces the post-apocalyptic setting and the racers that inhabit it, but it too is let down by the age old translation trope of a questionable localisation. It’s not that the writing is bad per se, but it is just too stilted to feel totally natural. It’s a shame too, as initial impressions of overly sexualised female characters and awkward dialogue run counter to how clever the actual gameplay in Fuel Overdose actually is. 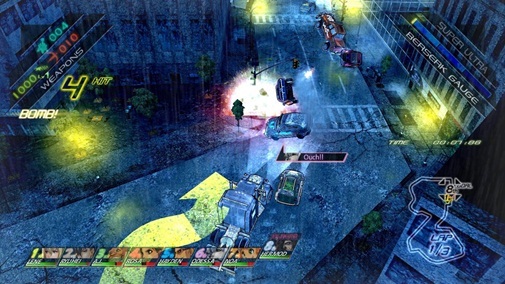 Most races are, as expected, a simple case of being first past the finish line, though various other objectives are introduced liberally during the single player story. The handling is the first thing to separate Fuel from many other racers as, depending on your choice of racer and vehicle, your turning circle and speed can vary hugely. The sheer variety of handling styles on offer, as with many other aspects of Fuel is daunting initially, but it soon becomes all too familiar after a few games. That said, there are plenty of game mechanics new players still have to get their heads around. You get three basic weapons in the form of the fairly self-explanatory machine gun, rockets and mines. Complementing these are grappling hooks that you can attach to scenery for a better turning circle, or to other players to pull yourself forwards or to deliver a harmful electric shock over the cable. You also get detonators that activate bombs that show up around the map but, these too are limited, meaning you have to use them sparingly. All of these weapons must be bought and levelled up prior to the match, and you only have a limited budget to use for each race. Further decisions must be made on whether you go for the level specific power ups, a devastating contextual power that players must bet on before the match starts. The highest bidder gets it, so it’s a real risk/reward scenario. Outside of the equipment, character and vehicle choice is also essential. 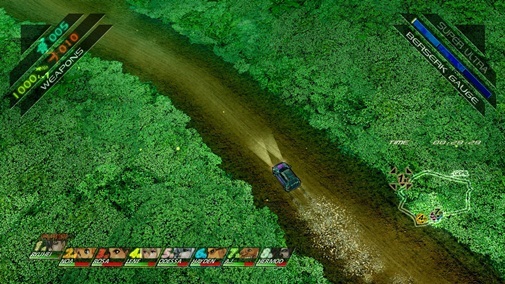 Characters and their cars both affect driving performance, allowing you to counter or accentuate a character’s native stats with an appropriate car. The main difference between the characters is their special moves. These are used through a combination of right analogue stick movements in a manner not dissimilar to 2D fighting games. Players have a hyper gauge that must be used up to activate these moves but, as this meter must also be used to power your shields, it can be a risky business using it for offensive purposes too regularly. With all these options, gauges and abilities to consider, you can imagine how hectic things get in-game. Even in the simplest of games, things happen quickly and often, what with eight players vying for space on the cramped roads. Levels are designed in such a way as to provide frequent bottle necks and, whilst this ups the tension and gives the game a fantastic sense of speed and urgency, it can be absolutely bewildering at times. The sheer pace of the game often prevents you from really getting to grips with the game’s numerous mechanics, as it can be difficult enough just staying alive when you have seven other racers hot on your heels. This is part of what makes Fuel Overdose equal parts frustrating and rewarding. Getting stuck in to begin with yields little aside from suffering, in spite of a fairly thorough tutorial, but the sheer amount going on means that the game just keeps on giving. Things are already lengthy enough with each character having their own story, as well as the usual time sink of online multiplayer, but Fuel is a game where it makes sense to have so much content. Too many games offer endless levels but without the depth of gameplay to keep players interested. Fuel, by comparison, provides greater intricacies the more you dig beneath the surface. The online multiplayer is worth contemplating in more detail. It’s a lot of fun, and the complex myriad of mechanics in Fuel provide a large enough skill gap for multiplayer to become truly competitive. The issue comes in the lack of local or LAN alternatives. Though it isn’t the most accessible of games, a fast paced racer like Fuel would be just what the doctor ordered for a quality gaming night in, a reality that can’t be realised with online multiplayer only. Granted, I doubt Fuel would make sense in split screen, but it would have been nice to see i-Friqiya at least making an effort in this area. This becomes doubly true on account of how low the population is for Fuel’s online mode. Very few players are ever online at one time, making finding a match a huge drama. This is only likely to get worse with time, considering how alienating Fuel’s mechanics can be to new players. Of the three main categories of game recommendation, Fuel Overdose falls heavily into the “try before you buy” circle. It’s an interesting game, and one that, like a fine cheese, only gets better with time. Having said that, it’s not a smooth ride. Whether it’s due to misleading character designs, bad dialogue, or impenetrable and occasionally superfluous combat mechanics, Fuel is a game you have to work at to truly enjoy. Based on the kind of gamer you are though, this work up front may well pay off with the sheer depth on offer in Fuel Overdose. A quirky and unique racing experience, Fuel Overdose will rub plenty of people the wrong way, but its creative take on the racing genre is likely to win over a niche audience.